RePub, Erasmus University Repository: SYNTAX II and SYNTAX III trials: What is the take home message for surgeons? Percutaneous coronary intervention (PCI) has evolved greatly in the last 40 years since its introduction by Andreas Grüntzig in 1977. Since then, we've observed an evolution in balloons, the development of stents, changes in stent structure, development of drug eluting stents, improvements in strut design, thickness and even their polymeric coating. Most recently we saw the rise and "fall" of bioabsorbable scaffolds for PCI. Trials with the most diverse devices for PCI and diagnostic techniques have been conducted. Two of the most recent trials were reported in the last year and deserve special attention-SYNTAX II and SYNTAX III. These trials are completely different in design but present valuable information for doctors managing coronary artery disease (CAD). Both trials take into account contemporary technology for assessing and treating CAD. The first uses so-called "state-of-the-art" PCI and compares the outcomes of that approach with the outcomes of the PCI arm of the pivotal SYNTAX trial. SYNTAX III Revolution on the other hand does not focus on clinical endpoints: it is a blinded trial that does not randomize patients but randomizes doctors ("the heart team") to make a decision on the best treatment for complex CAD. This decision was based either on multi-slice CT with physiological assessment using FFRCT or on conventional angiography. 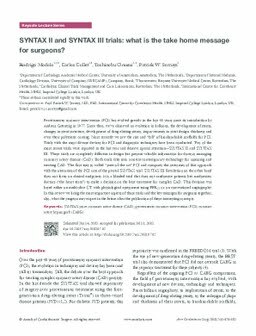 In this review we bring the most important aspects of those trials and the key messages for surgeons together; also, what the surgeon may expect in the future after the publication of these interesting concepts.